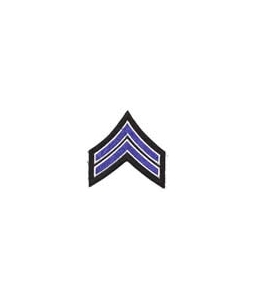 Corporal Chevrons 3,5"- Royal/ White/ Black | 800618, PREMIER EMBLEM COMPANY, Corporal Chevrons 3,5"- Royal/ White/ Black | McDonald Uniforms, Inc.
Add this patch to cart for a single purchase, if you want it applied to a product DO NOT add to cart. You can customize your selection with this patch. Sold to Law Enforcement agencies and personnel only. Perfect for uniforms, coats or anything else in need of some powerful decoration. Sold in pairs, these sewn-on Chevron patches are a great way for corporals to decorate their personal items.